You will receive a full-sized, dressed and blessed novena candle WITH one of my famous custom oils! The Almighty Hand or Hand of Power is an ancient Roman icon used for defense, the most powerful hand of the gods. For Christians this was the most high and holy god of the heavens, for pagans it was the hand of Zues of Jupiter. Now, it can be used to invoke the highest power of whatever god/ess you choose to work work with. Variations of this talisman can be traced back to the ancient Egyptians. 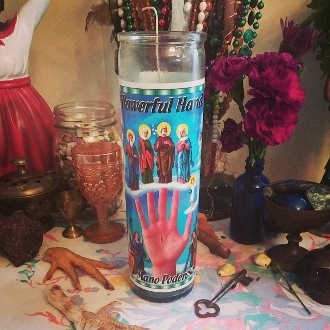 Also known as the Mano Poderosa, it is an extremely popular and powerful symbol, especially for practitioners of the occult in Mexico, because it is believed to possess secret and kabbalistic power within it. There are different versions of this icon, with earlier representations showing the saints in different conjuctions with the fingers on the hand. The modern version shows the Child Jesus on the thumb, but that of 19th century Mexican retablos showed in on the middle finger. Generally speaking, the other saints will always be Santa Maria, San Jose, Santa Elizabeth and San Joachin. This ancient seal portrays 5 saints sitting on an outstretched hand-one seated at the tip of each finger. It was originally a talisman used for defense, in war and in magick. It is also used to defend one against dark magick and to call upon justice for those who have harmed us or our loved ones. I think everyone should have this image in their home at the least, it is so beautiful, historical, and powerful. Created with sandalwood, lily of the valley, mimosa, musk, and jasmine-each scent is connected to one saint.